A couple weeks ago, I received a phone call from someone at CBC radio. The “On the Coast” program hosted by Stephen Quinn was doing a short segment about blackberries and had a few questions for me. A google search by their researchers revealed that I’m not only a forager of local blackberries but I’m a big fan of the fruit. I was asked a few questions and then asked to go to the CBC studio the next day. Needless to say, I was a big bundle of nerves. What if I stumbled or said “ummmm” every few seconds? Well, it turned out that the whole thing was really fun and a great experience. And you can listen to me right here defend this wonderful fruit and hear my nervous giggles! Thanks again to CBC Radio & On the Coast for letting me post this clip here! Over at Poppytalk I’ve been busy whipping up some fantastic things! On Wednesday I wrote about a super simple – but totally elegant – peach tart using the best local fruit. It can easily be made vegan too! And last week I made a stack of buckwheat pancakes which are gluten-free and totally delicious. Light and fluffy and wholesome? Check! I love it! I’ve picked a gallon bags worth of blackberries this year, but I may just have to get some more. You sounded perfect, like a real pro! Good job for doing it. I also love the tartness of blackberries (and grapefruits!). Really want to make that peach tart too! Really enjoyed listening to that Jeanette. It made me laugh. I am also a blackberry freak. I have some growing in my back yard which take very good care of. I also go out blackberrying on walks with my dog. She loves them too and sits and waits until I throw her a few. Blackberry and apple together is also very nice. The English are fond of a that combo in a crumble or pie. I love blackberries too! They are such a treat every summer. I loved listening to you talk. Blackberries grow very easily here, too, and just like you said happens in Vancouver, here they are often by roadsides, train tracks and other undisturbed areas. They are supposedly near any place where poison ivy grows, so you have to be careful of poison ivy, and according to one of my friends, snakes! Eek. That said, picking blackberries is fun, and there are a lot of growers. I’ve picked at a local berry farm. Love blackberries. I like jam, and pies, along with the fresh berry itself. love the blog and your cbc interview was great… you didn’t sound nervous to me. so lucky that you have wild blackberries in your own neighborhood. As a fan of blackberries, I enjoy them in all kinds of ways from topping my bowl of cereal to eating them ‘as is.’ I can’t understand why some people have an aversion to them other than because of where you find them growing. Unfortunately, we don’t have the great fortune of finding wild grown blackberries in our neighbourhood in TO, so I buy them at the market for $3.99/4.99 for a 1/2 pint, which is just ridiculous. But I can’t resist. It was also great to put a voice to your face. You did a great job on the radio gig!! Gotta have our blackberries! And as you say the best part is getting them for free! I made a blackberry and apricot gallette a couple of times based on your gallette recipe of a few years ago. I still dream about it! And you sounded great on the radio! Jacqui, I know, blackberries are so good & way too easy to pick out here! Catherine, I love blackberries and apples too, a great combo. And I love the image of you throwing berries to you dog. Cute! Bellcurves, wouldn’t want to run into any snakes! But there are usually hobos living under bushes (natural defenses and all that). Thanks Bijoux for your nice words. I know, blackberries can be so pricey here so I love that i can get them free for a limited time. It also helps to make hikes so much more pleasurable when you can snag some berries for refreshment! Hag, that is such a good recipe & one worth dreaming about 🙂 Thanks so much! Also, you were talking about BLACKBERRIES, which are a wonderful fruit. My friend and I canned a dozen cans of blackberry jam last weekend, plus made a cobbler out of them. I’m so sad blackberry season is ending, but my freezer is full of the frozen berries I picked this summer. Hope your blackberry reserves are full, too! 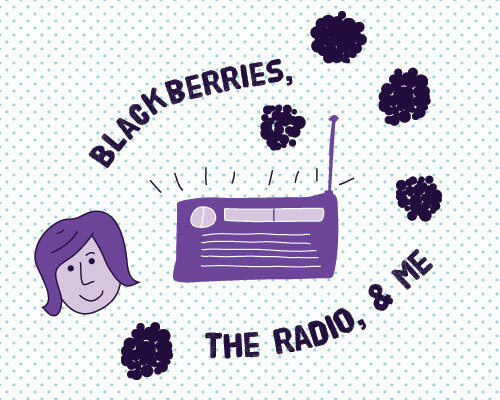 Thanks so much Kate, I had a great time on the radio & would love to do it again 🙂 Sounds like you’ve had a great blackberry haul – jealous of all that canning! Hi. I’ve been a silent admirer of your blog for a while. Pretty much every recipe you put out there looks delicious and sometimes feels slightly nostalgic. I enjoyed listening to your radio interview. We had a blackberry bush in our yard started from a tiny sprig a friend gave me. It nearly took over our little garden and its roots seemed to travel well underground as it started making appearances in a couple of neighbors’ yards too. In fact, it spent so much time working its way into other peoples’ yards that we had to transplant it at Grandma and Grandpa’s house, where fruit bearing plants rule. (Sorry about all the typos in my previous comment and sending this twice. I’ll blame it on early morning blurry eyes). It’s really, really warm here and I guess it was a very happy plant…. Lisa, hooray for happy plants!